Trend graph and data table of the arcing and tripping time give you a clear picture what condition the breakers are. Breaker is critical equipment in electric substations. Breaker performances are basically of mechanism, insulation inside the chambers, and contact wear. POLARIS breaker monitoring module can be used to various types of breakers ¨C oil, vacuum, and SF6. 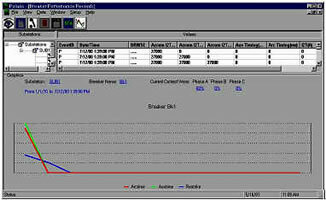 The POLARIS breaker module logs all the breaker trips into ODBC database to further offline study. And POLARIS breaker module has no limits on number of breakers to be monitored in a substation. The POLARIS breaker monitoring OPC interface is compatible with OPC specification and supports alarm/ event interface. The module can run as NT service.